The Samsung Galaxy Premier has been officially unveiled after months of rumours surrounding the existence of the smartphone. 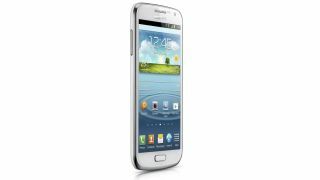 Similar in style and substance to the Samsung Galaxy S3 Mini, the Galaxy Premier will be hitting selected markets is Eastern Europe and Asia. The Galaxy Premier sports slightly tastier specs than the S3 Mini, with a 4.65-inch, 720x1280 display, 1.5GHz dual-core processor, 1GB of RAM and a 8MP camera all on board, plus it comes running Android 4.1 Jelly Bean. Since the launch of the Google Nexus 4 by LG, the Samsung Galaxy Nexus has been discontinued, with the Galaxy Premier likely to fill the void in the Korean firm's range. Samsung will be offering both 3G and LTE models of the Galaxy Premier, and according to Samsung Ukraine the handset will be available sometime in November for around £420 ($680/AU£655) SIM-free. It looks unlikely that the Samsung Galaxy Premier will reach the likes of the UK, US and Australia, with countries such as China and Korea targeted instead.